The Blogger, The Law & The Brand is a master class panel session hosted by Olorisupergal and Foza, that is targeted at the newly founded niche in media called “Blogging”. The event is going to explore the blogger’s responsibility in the media world, the business opportunities involved and the legal operations in blogging. In lieu of the theme of this year’s Social Media Week 2015 theme, “Upwardly Mobile: The Rise of A Connected Africa”, our session would explore a fundamental structure for the blogging community which is fast becoming a new employment sector in Africa. The function of this session is to ignite a consciousness in the global connection potential in Africa’s digital space. The focal point of our session would be – What is the concept of blogging?, Is blogging a viable business venture?, Are there legal responsibilities and protections for bloggers?. 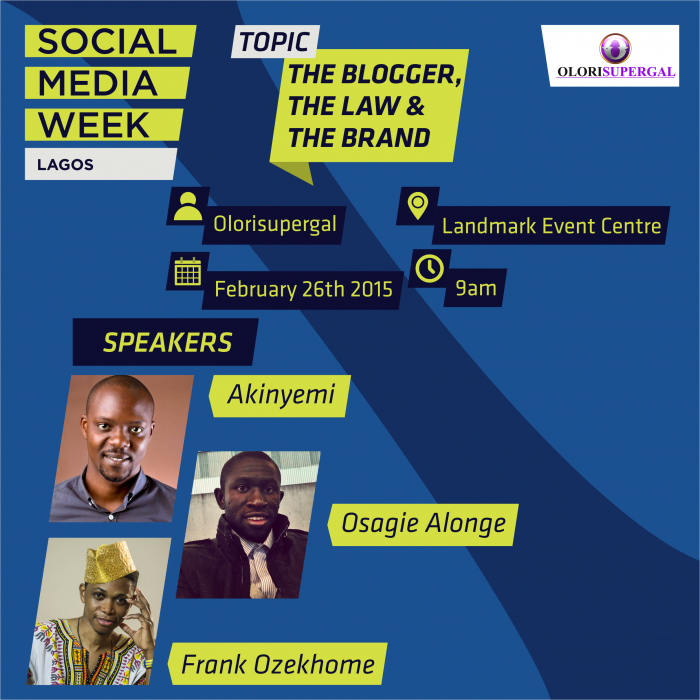 Our Speakers for the day are: Osagie Alonge (Blogging), Akinyemi Ayinoluwa (Law) and Frank Ozekhome (Branding). Also follow @Olorisupergal and @fozadoza for event updates and also follow the conversation online using the hashtag #smwbloggerlawbrand and #smwlagos.